Keep It 1.6.7 for Mac is now available. This version fixes issues with and makes improves to Dark Mode, summaries of Markdown files, AppleScript, the format bar, and decrypting with Touch ID. See the release notes for a full list of changes. Existing Keep It users can get this update through the app's built-in software update system. Mac App Store users will get the update following Apple's review. Keep It 1.6.5 for iPad and iPhone is now available. This version fixes issues editing lists in notes and rich text documents, improves PDF viewing, downloading all items from iCloud, and automatic link detection. Existing users will get this update automatically through the App Store. See the release notes for more details. Feeder 3.6.4 is now available. This version fixes issues publishing with Amazon S3 and FTP, and fixes issues customizing colors in the editor. Direct Feeder 3 customers will get this update through the app's built-in software update system, and Mac App Store customers will get the update automatically or through the Updates tab following Apple's review. See the Feeder Downloads page for more downloads and a full list of changes. 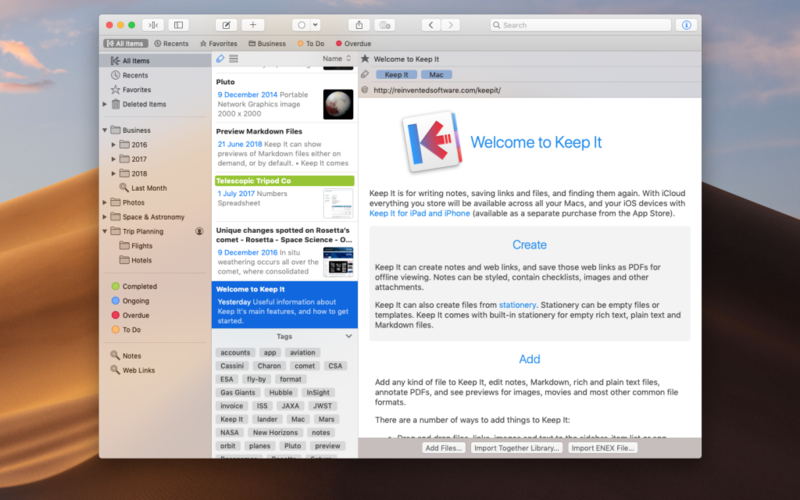 Keep It 1.6.6 for Mac is available today. This version improves editing and finding text, fixes issues with labels, moving folders and the Activity window . See the release notes for a full list of changes. Keep It 1.6.4 for iPad and iPhone is now available. This version improves PDF viewing, saving web links, the Share extension, Files app support, Markdown editing, iCloud defaults and more. Keep It 1.6.5 for Mac is available today. This version fixes an issue where it would not be possible to save web links for offline. See the release notes for a full list of changes. Keep It 1.6.4 for Mac is available today. This version fixes issues with iCloud defaults, Markdown editing and exporting, and the share extension. See the release notes for a full list of changes. Keep It 1.6.3 for iPad and iPhone is now available. This version improves editing lists in notes and rich text documents, fixes issues with the Share extension, search, support for the Files app and more. Keep It 1.6.3 for Mac is available today. This version adds the ability to update Finder comments, fixes issues with automatically renaming items created from stationery, PDFs, Markdown files, and the Share extension. See the release notes for a full list of changes. Feeder 3.6.4 is now available. This version fixes issues with the FTP server browser, editor fonts, landscape view, and updates the FTP software. Keep It 1.6.2 for iPad and iPhone is now available. This version fixes an issue in 1.6.1 where newly added lists, labels or tags would not be saved to iCloud. Existing users will get this update automatically through the App Store. See the release notes for all recent changes. Keep It 1.6.2 is now available. This version fixes an issue in 1.6.1 where newly added lists, labels or tags would not be saved to iCloud. See the release notes for a full list of changes. Keep It 1.6.1 for iPad and iPhone is now available. This version makes improvements to text recognition, and fixes issues with notes, and iCloud. Keep It 1.6.1 is now available. This version makes improvements to text recognition, and fixes issues with iCloud, Markdown previews, and the share extension. See the release notes for a full list of changes. Keep It 1.6 is now available for Mac, iPad and iPhone. This version introduces text recognition for images and scanned PDFs, the ability to create web archives on iOS, new Siri Shortcuts that work with the clipboard on iOS, plus other improvements to PDF editing, search, the Share extension, notes, text editing and more. Keep It can now recognize printed text in images and scanned PDFs. Keep It does this on the device using the latest machine learning, computer vision and image processing technologies for the most efficient and accurate results. Import PDFs or images from a scanner on Mac, and import standalone photos directly from your iPad or iPhone using Continuity Camera in macOS Mojave. To complement the above, it’s now possible to rotate and remove pages in PDFs on both Mac and iOS. Keep It can now also strikethrough and underline text in PDFs too. Keep It for iPad and iPhone can now save web archives. Choose your preferred format (web archives or PDFs) in Keep It’s Settings, or change the default when saving individual links. Notes can now contain dividers, and it’s also possible to show attached images at a smaller size. Keep It will also preserve dividers when importing from Evernote. Insert the date and time in notes, rich text files, plain text files and Markdown documents. Customize the font for Markdown and plain text documents on iOS. The Share extension can now create items in formats other than notes, based on the format of the default stationery. For example, if your default stationery is Markdown, the Share extension will create Markdown documents instead of Keep It notes when adding text. The Share extension can now append links and files as attachments to Keep It notes or suitable editable text files, will show up to five recent items and lists in the Share extension, and shows favorites above all the other items or lists. It’s now also possible to show the comments field in the Share extension for links and files. 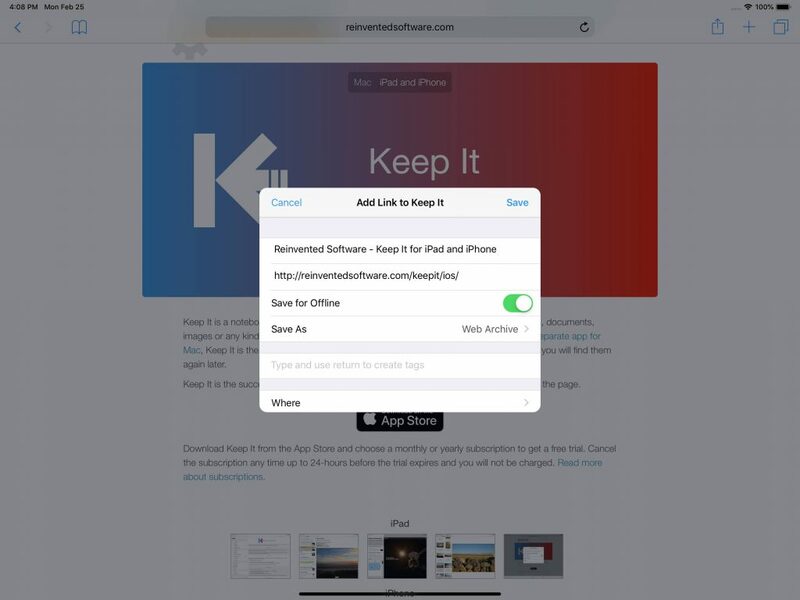 Keep It adds new shortcuts for adding a note or web link from the clipboard, and for appending the contents of the clipboard to notes and other editable text files (after you’ve pasted something). Names in the item list or thumbnails now wrap for up to two lines. It’s now possible to search for items by generic types of media such as images, audio and movies rather than a specific file type. View rich text files in Dark Mode on macOS Mojave. For a full list of changes, see the Release Notes for Mac, and for iPad and iPhone. Keep It 1.6 is a free update for all existing customers.